The inquisitive Dachshund is small in size, but big in personality. They make incredible watchdogs for such a tiny canine and are not afraid to use their immense amount energy supply. They are natural hunters and have great digging abilities as well. The Dachshund is a scenthound and loves to frolic in their family environment. They can be trained to blend in easily with the children they reside with on a regular basis, but for little ones they may not know they can have a tendency to snap at them. Some bark, but not all and they can be observers of any strangers that come into their homes. They are bred as minis and those ones have been known to be more reserved than the larger sized ones. They are energetic creatures and can still remain rather independent. They do not require a ton of attention when it comes to having plenty of room to run and play, but they will prefer a walk each day. Due to their small size, they can easily fit into a small apartment or reside in larger cities. They are pleasant living indoors and a small yard for them to roam in is the ideal living arrangement for the Dachshund. Depending on the type of coat the dog has it may require some grooming each week. The smooth ones need the least amount of grooming and the long and wire coat ones will need more grooming. Stray hairs may need clipped from time to time and nail clipping as needed. Intervertebral disk disease is very common in Dachshunds. Occasionally KCS and seizures have been found in them. Some suffer from diabetes and gastric torsion as well. Double dapples tend to result in poor hearing as they age. Eyesight testing may be needed as time progresses and due to their small size you will need to make note of their weight. 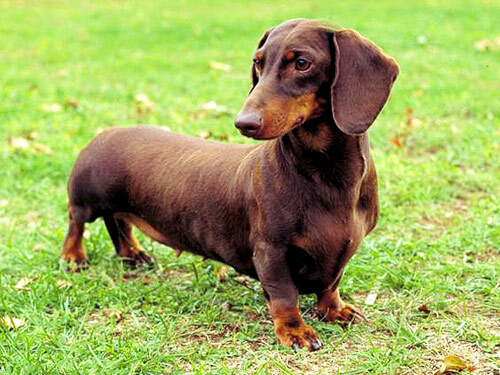 Many Dachshunds gain weight easily, some even becoming obese. They have an average lifespan of twelve to fourteen years long. This breed began in the 15th century in Germany. The Dachshunds were known as the breed with crooked legs and also as great hunters. They are bred in three fur coat variations, from smooth to long to wire. They continued to expand in popularity by breeding with Spaniels and gundogs alike. The wire breed of Dachshunds were more common in the 1900’s and continued to expand that great hunting reputation. They have been known to easily hunt badger, fox and rabbits. They are common family pets and extremely popular in the United States today. Their easy ability to reside amongst children and other animals in the home drives their popularity as household pets. The tiny hunters are playful, agile, affectionate and full of energy. They can be raised in cold or warm climates and generally reach an adult weight of around sixteen pounds. Dachshunds reach around five to six inches in height while the adult ones can be anywhere from eight to nine inches tall.